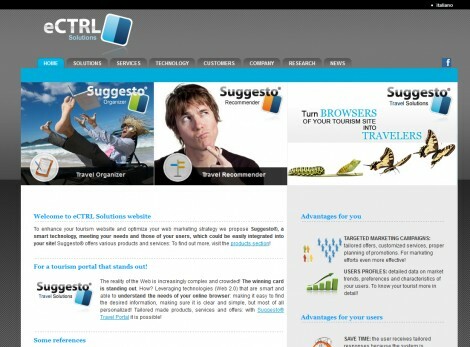 ECTRL Solutions S.r.l. is a spin off company, founded in 2005, of the Center for Scientific and Technological Research (ITC-irst, now Fondazione Bruno Kessler), a well known Italian research institute specialized in the Artificial Intelligence and Microelectronic sectors based in Trento. eCTRL Solutions has been founded to further develop and market the research results of the center in the fields of e-commerce and Tourism. eCTRL Solutions activities cover three major areas: a) Advisory Systems, focused on the development of technologies for enabling the automatic recommendation of tourist products (recommender systems) and personalised adaptation of the contents; b) Mobile Applications and Tourism, whose target is to study, define and develop tourist services for mobile devices; c) Data Integration and Interoperability, focused on the integration of content providers and interoperability of the different existing applications and tourist participants. The SUGGESTO platform, based on the Trip@dvice company’s proprietary technology, is the major product commercialized by ECTRL Solutions. Trip@dvice is the most advanced recommender system explicitly designed for the tourism domain. Thanks to Trip@dvice, tourists can self bundle their travel plans by selecting the most interesting tourist products and services. Trip@dvice exploits innovative Artificial Intelligence methodologies to help tourists in their decisional process by providing personalised suggestions on tourism products matching their travel profiles. www.visitfinland.com, the national tourism portal of Finland, where the company realized the travel planning and recommendation component of the portal. This component enables the generation of personalized recommendations on several tourism products like accommodations, activities and attractions. For supporting search and booking capabilities, it integrates the metasearch component of the portal, providing a uniform interface over the booking engines connected to the portal. www.visittrentino.it, the official tourism portal of Trentino, one of the major tourism regions in Italy, where the company developed the travel planning component, the search functionalities, and a middleware for integrating structured contents from external sources. www.atl.biella.it, the official tourism portal of the Italian Province of Biella, where a complete suite of travel planning, search, recommendation and front-end facilities have been delivered for a comprehensive portal solution.